Thanks Chris. There do seem to be quite a few photos of DSWA schutztruppen around so hoping that someone might have a clue? PS still keen on seeing your Alpine photos with kS98s in action! As I have mentioned earlier the earliest dated KS 98 bayonets I have seen is 1904 .I believe the First KS 98 bayonets came into DSWA in 1904 with the troop reinforcements which arrived on 11/06/1904 ,under lt. Gen von Trotha .These reinforcements were sent from Germany due to the outbreak of the Herero Rebellion in 1904.It is logical that they would bring the latest weaponary with them . I found a photo taken in 1904 of uniforms worn during various periods in DSWA ,that might help.the soldier on the right, from the viewers perspective , is wearing the latest uniform with the M98 rifle,the new bandolier and I believe he seems to wear the KS 98 bayonet which was far shorter than the previous models often shown on Berlin studio photos. This is not conclusive evidence though ,as the ofiicial bayonet as per “Bekleidungsvorschrift “ ( Uniform regulations) as specified by “ AKO “( Royal orders) dated 19/11/1896 for “Kaiserliche Schutztruppen “ ( Royal Protectorate Force) , was the Seitengewehr M71/84 .This bayonet only has a blade length of 250mm which is of coursevery similar in length to the KS 98 bayonet which has a blade length of 253mm. I have recently come across KS98 with composite reddish grip ,marked ERFURT and dated 1913, which has the crosguard stamped KS 5259. 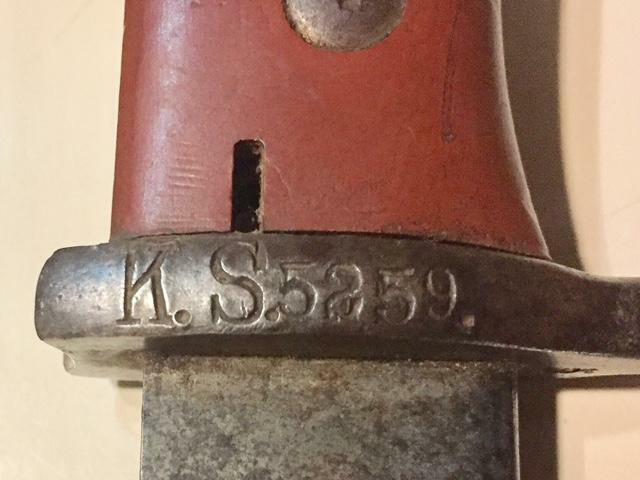 As you know I keep a list of all KS Bayonet details for many years and this is the latest marked KS 98 bayonet I have seen .The earliest I have seen is was dated 1904. According to Reinhard Schneider's "Die Kaiserliche Schutz und Polizeitruppe fuer Afrika". 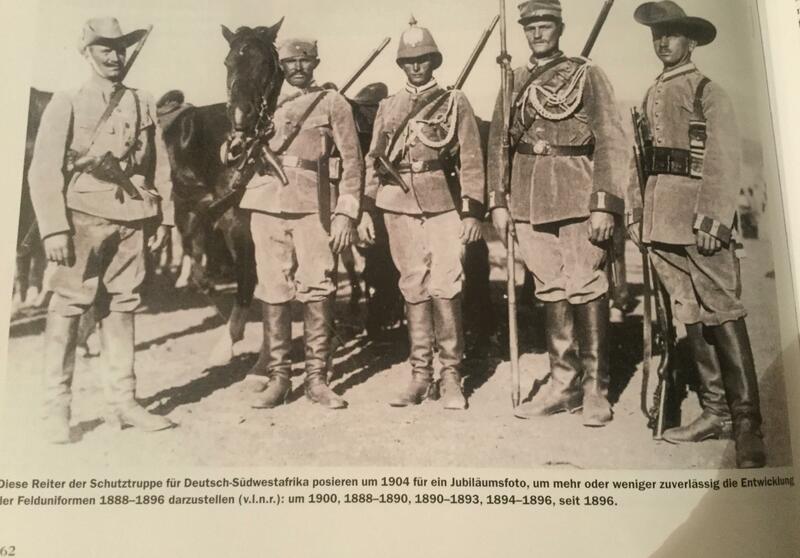 The 1904 DSWA reinforcements had S98 (Lange)- but their artillery and MG units had kS98. Then in 1909 all DSWA Schutztruppe were issued kS98. I think that ties in with what we see in collections, roughly? I've just got back from a trip to Namibia. I spent week in the sun while the UK shivered but of course the you know the weather wasn't the real reason I was there. I was of course looking for DSWA remains. I found the expected Swakopmund museum, the Reiter memorial in Windhoek, a few artillery pieces at the Alte Fest etc etc. 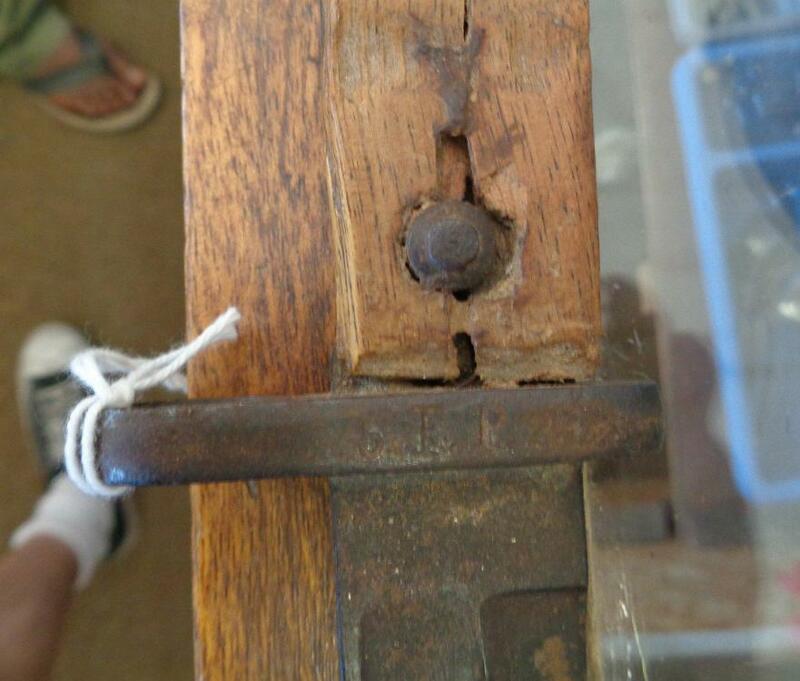 But one real surprise was in a seond hand shop in Swakopmund. Amongst all the usual brick-a-brack in a glass cabinet was a bayonet. I took a closer look- an S71/84 with unit markings! 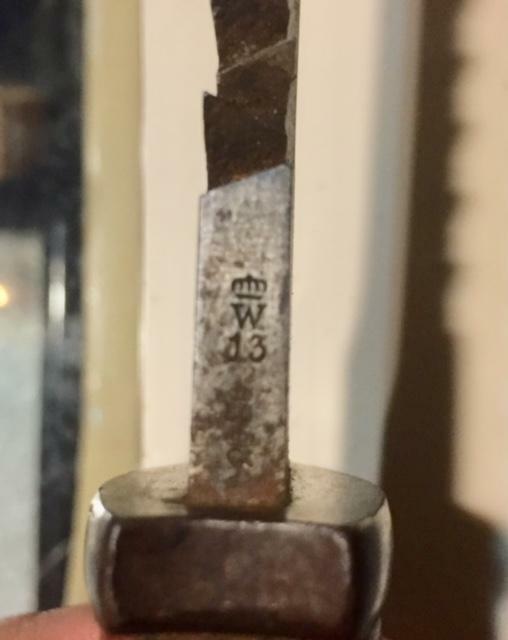 Isn't this then the oldest DSWA bayonet we've seen? I couldn't photograph it well in the case so I told the shopkeeper honestly, “You've got a great bayonet there. I can't afford it and even if I could I couldn't take it back to UK in my luggage, do you mind if I take some close up photos of it out of the case?” and gave him a tip in Namibian Dollars for the favour. It's not in great condition and the markings are faint. They seem to read “5.FP 2.123”. 5. Fuhrpark-Kolonne? The date mark is W?8 and I couldn't read the maker mark at all. 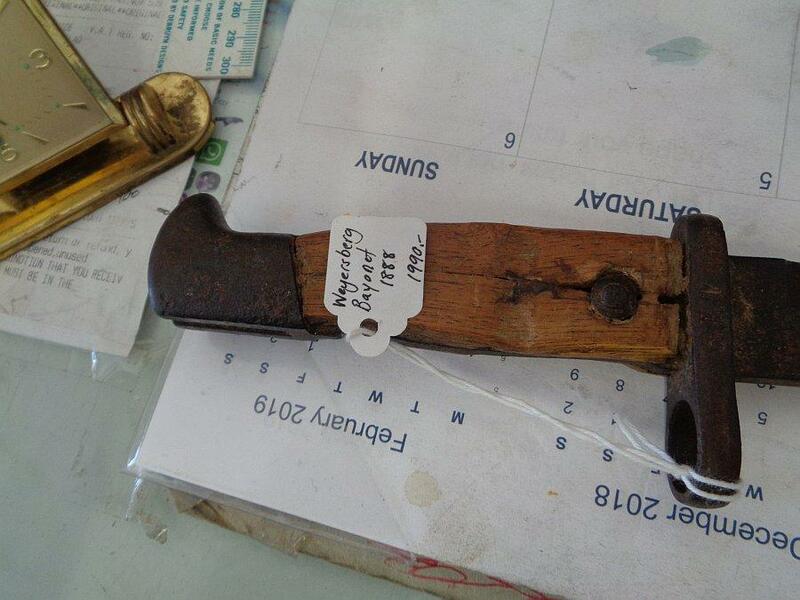 But there's a tag on the bayonet saying 1888 and Weyersburg, which of course would seem to be a very good guess. I am going to play devils advocate here ... do we know it is a DSWA bayonet? Yes, that of course is an outside possibility and I'm always up for devil's advocate arguments in general but FP5 seems a plausible marking to me for the reinforcements of 1904-05, and the S71/84 would seem a more practical and shorter bayonet than the S98 offered to the new frontline Schutztruppe units. 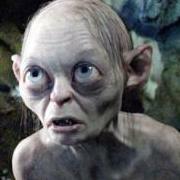 ...and thank you for the compliment Bayern. But I admit it is not without faults. Hi, what throws me off would be the Fuhrpark Kolonne, were there 5 of them in DSWA?.... maybe a Feld Pionier company? Perhaps the armourer didn't make that distinction? Perhaps the distinction was made after the bayonets were issued? Or perhaps as you suggested it has made the journey back from the Western Front?